Moombahton’s mix of electro and reggaeton could almost have been tailor-made for A Tribe Called Red. The bastardisation of Dirty Dutch house and reggaeton — first brought about by US DJ Dave Nada slowing down Afrojack’s remix of Chuckie & Silvio Ecomos ‘Moombah’ — is like the synthesis of the musical tastes of Deejay NDN and Bear Witness from ATCR. NDN is the electro guy, while Bear grew up on reggae, dancehall and jungle — “anything with that ragga vibe,” he says. 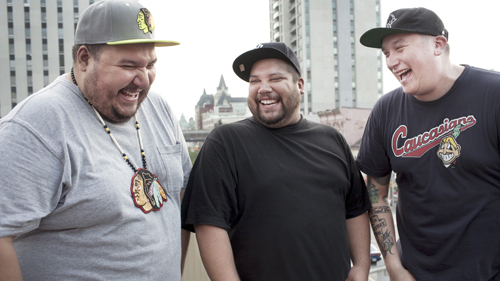 Both Bear and NDN originally hail from the Cayuga tribe in Ontario, and they met while both working in a club in Ottawa. 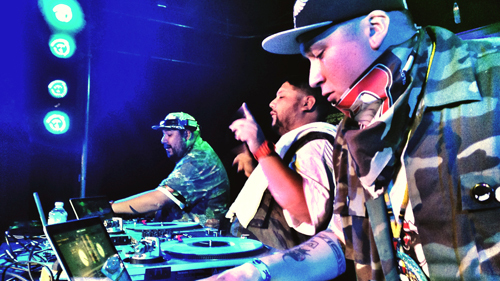 When DMC turntablist champ DJ Shub visited, a hip-hop freak, they hit it off immediately and asked him to stay. ATCR don’t just rock the party, but they bring in samples and visuals from Native cultures to add a thought-provoking element to their performance. Some of these are powerful tribal chants or bone-rattling medicine drum stomps, or samples from Hollywood films and Westerns portraying Native peoples as ignorant savages. Bear video-mixes images from films and re-contextualises them, reclaiming misrepresentative images of Aboriginal people and turning them into something empowering. The result is immense. “Once the United States was formed, that’s when the so-called ‘Indian wars’ started,” says Bear Witness. “Which was never really a war, it was people defending their land. Despite shining a light on Canada’s disgraceful hidden history, ATCR insist they’re not trying to be ‘political’. “It’s a responsibility, it’s something we have to do as indigenous artists,” says Bear. “It’s part of the package.” So they have a song called ‘Woodcarver’ about John T. Williams, a deaf Native American kid in Seattle who was shot by the police. But at the same time they’ll whip up their dancefloor into a psychedelic electronic melange and have the whole joint rocking by the end of their fearsomely funky set. At the interview in Brighton in the afternoon, the guys start talking about Back To the Future 3 (“when Marty goes back to the Wild West in his Delorean”) and Predator (“Other than Arnold, the Native character Billy is the only one who goes toe to toe with the Predator”) and otherHollywood films such as the Buffalo Stampede from the 1930s. “The rest of it is white dudes with wigs falling off horses in buckskins, but then there’s this one scene where they go to a community and it’s all real people — a real dance troupe in real regalia doing real dances,” says Bear. This scene is ripe for sampling and looping and re-contextualising — something ATCR pull off masterfully. DJ Mag asks ATCR what they consider the best filmic representations of indigenous peoples, and they start reeling off a list: The Fast Runner (Canadian film of Inuit tribe legend), Once Were Warriors, Dead Man and Ghost Dog — both directed by great leftfield alt.director Jim Jarmusch. Bear starts talking about how the Kevin Costner movie Dances With Wolves represented a bit of a change in the way indigenous people were represented. ATCR will certainly rock it just as effectively in late-night club sets, say at Fabric at 3am, as they do at festivals and live shows. Get involved.